This article is one of many convention reports written by a guest correspondent! If you are interested in becoming a guest correspondent for a convention, please email editor@animediet.net, and we'll send you some more info. Thanks! Waiting female participants. Photo by Charles Sykes, Associated Press. Advertised as a free weekend activity for convention attendees over 18, New York Comic Con brought back speed dating for the second time at this geek-filled con. 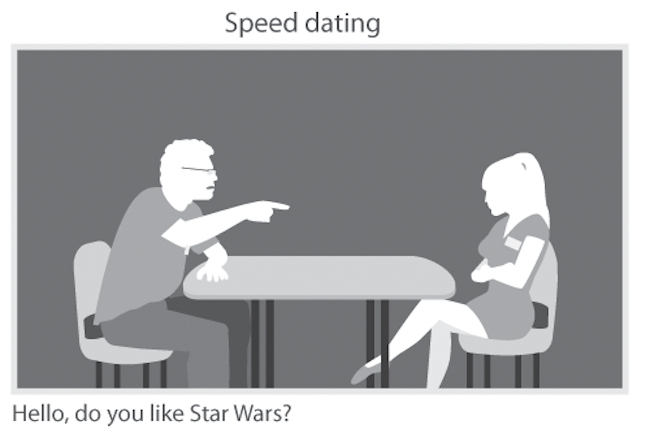 Since I am single, female, and have never speed dated before, I wanted to try this activity out. So even before the convention began, I registered for the event online at New York Comic Con’s website. It was a quick sign-up where I entered my name, email, age, and the time slot when I wanted to speed date. Afterwards I received a confirmation, and thus it became part of my Comic Con agenda. After spending an entire day at the Javits Convention Center, I went to the room where the speed dating was held. There was a check-in table, where I was assigned a number for privacy purposes, and handed a paper and pen. 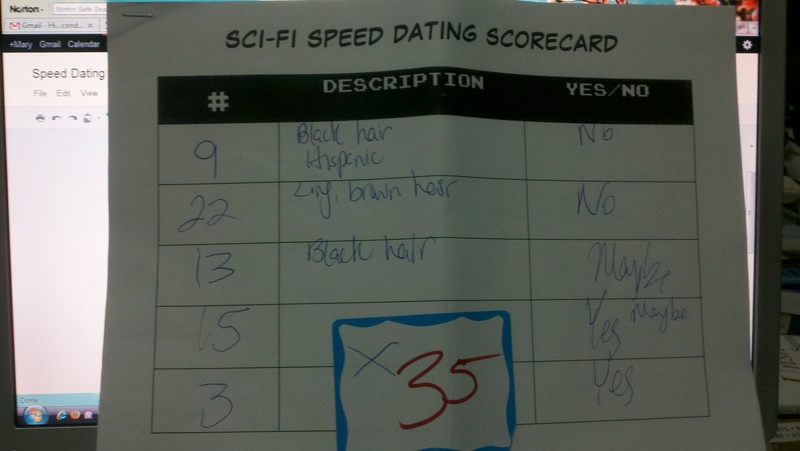 The paper was to be my scorecard for this “Sci-Fi” Speed Dating. There were three columns on the score card: the first column was to mark down the corresponding number for the other person, the second was a description of the person, and third was to say yes or no. The paper of ranking and destiny. While they were setting up the room, I found myself in line outside with the other female participants, while the males were on the opposite side. It seemed like there were more guys then girls overall, but there were more females who cosplayed than males. (I was one of the few female participants not cosplaying.) The girls were ushered into the room first, where there was a banner on the wall announcing the event’s name: “Sci-Fi Speed Dating.” The chairs were arranged in rows, pairs facing each other. The host had a good sense of humor, and he told the females that if we had any problems with an individual guy to raise an arm as if yawning. That would signal the end of that particular session. All the pairing were random, as the guys went down the line and sat in the corresponding opposite chairs to the girls. The host called through a bull horn for the guys to move to the next chair when their time was up. I was number 35, and feeling really nervous. In all I spoke with 22 other guys, for three minute sessions apiece. It was fun, but there were also moments of awkwardness. I distinctly remember that one question I was asked repeatedly was “Why are you attending Comic Con?” Sometimes I asked them the same question back. The responses I got were interesting, though often similar. There were a couple of guys I was interested in, but the three minute “dates” were quite short and superficial. Worse, my time slot was supposed to be two hours (8 to 10 pm on Saturday), but by 9pm, my session was cut abruptly short because they had to close the facility early. At both ends of the room there were long rectangle tables with blank sheets of loose leaf paper. They were meant for participants to exchange emails with those they were interested in enough to keep in touch, at the end of the session. But while the sessions were entertaining, there seemed to be little possibility for long term romance/relationships to be found from them. Still, having gained some experience from this year’s speed dating, perhaps I’ll be ready for another round next year. First of all, I have to apologize for how late this article is appearing; I became very sick after the convention and recovery has been slow between my day job and other personal commitments. My name is Jack, better known as StarCreator to some. 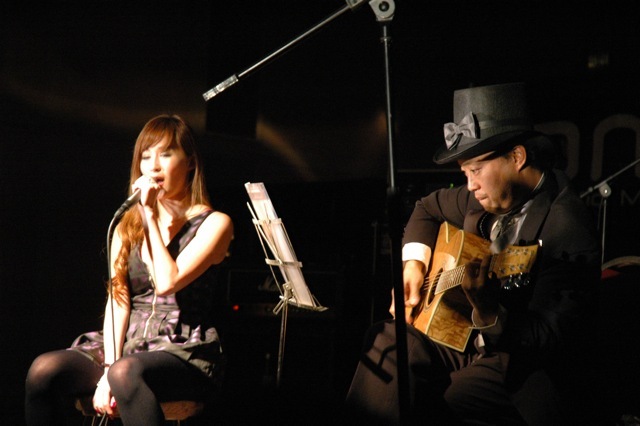 I was invited here to share my opinions and experiences at New York Anime Fest 2010. NYAF 2010 was definitely very unique, in that the parent company decided to combine it with their other, larger event, New York Comic Con. The difference this made was massive; in the span of a single year, NYAF went from being a small con focused almost exclusively on industry and their musical guests, to a behemoth of a convention encompassing everything from video game demonstrations to independent comic artists, with what was left of NYAF literally under their feet. The difference is so large, that even though I have been attending anime conventions for the better part of 11 years, the most similar convention to NYAF 2010 I have attended was actually PAX East last year – which makes sense, knowing both conventions are run by the same exhibitions company. The line to enter the convention Friday morning. Overall, I’m still not quite sure what to think of the convention. The two events definitely did not meld together well, and getting around was quite difficult due to the sheer number of attendees crammed into relatively small paths. The show floor itself, at its worst, was nearly unnavigable; I’m told there were a few dealers selling anime goods in a corner, but I was never able to wade in that far. In the end, I only made it to about half the number of events in the convention I had intended, as dealing with the large crowd was exhausting and most of New York’s better food options brought me far from the convention center. While there were some non-anime events that were quite enjoyable, such as seeing some really good StarCraft II matches at the Intel Extreme Masters tournament, I think that as an anime con goer, NYAF was better off when it wasn’t shoehorned into a much larger event. I still had a great time, but it was in large part due to the company I kept throughout the weekend rather than the events at the convention itself. 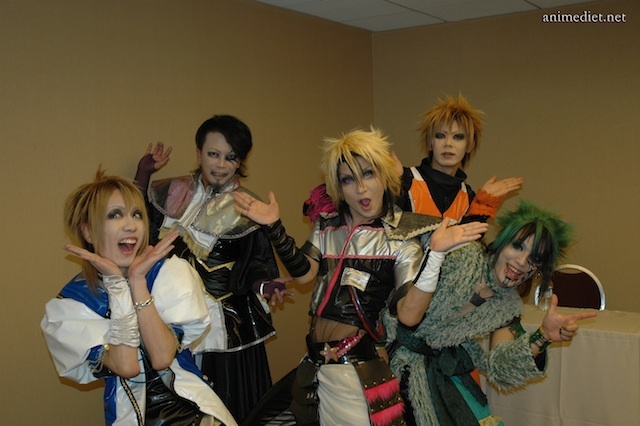 In the next part of my NYAF impressions, I’ll take a closer look at the specific events I attended.